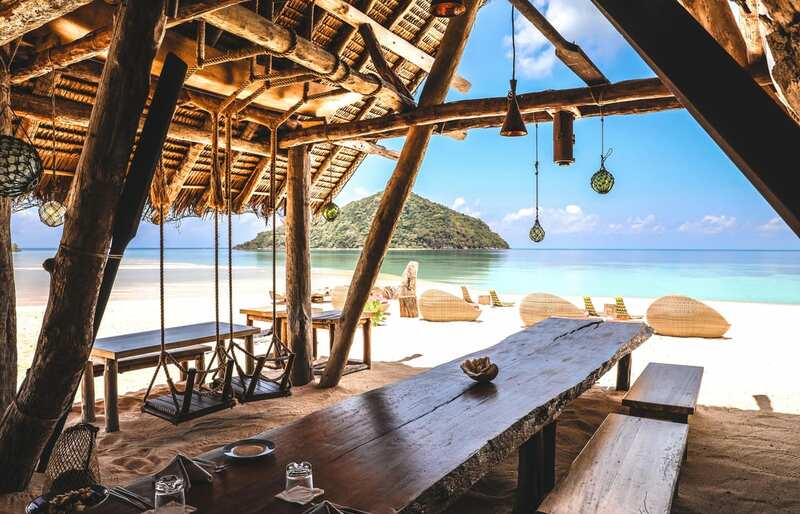 Bawah is a picture-perfect, tiny archipelago of previously uninhabited islands surrounded by turquoise waters, and covered by lush tropical greenery. 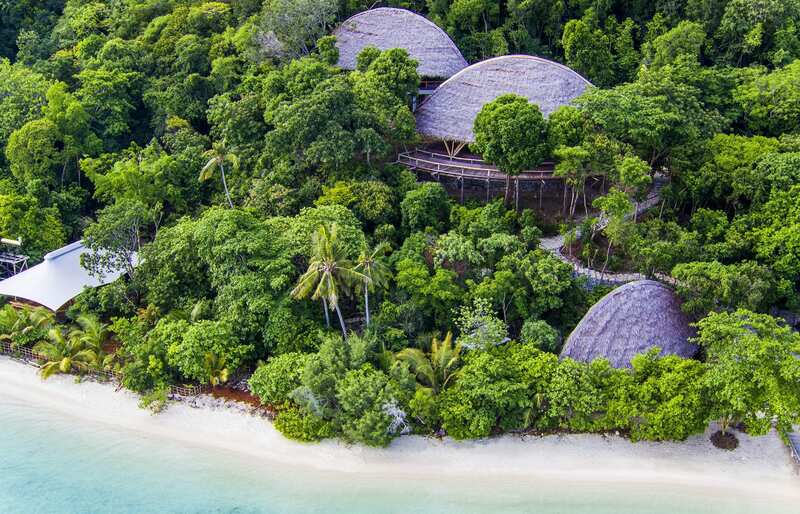 And it’s an ideal retreat for luxury travellers seeking their next undiscovered paradise. 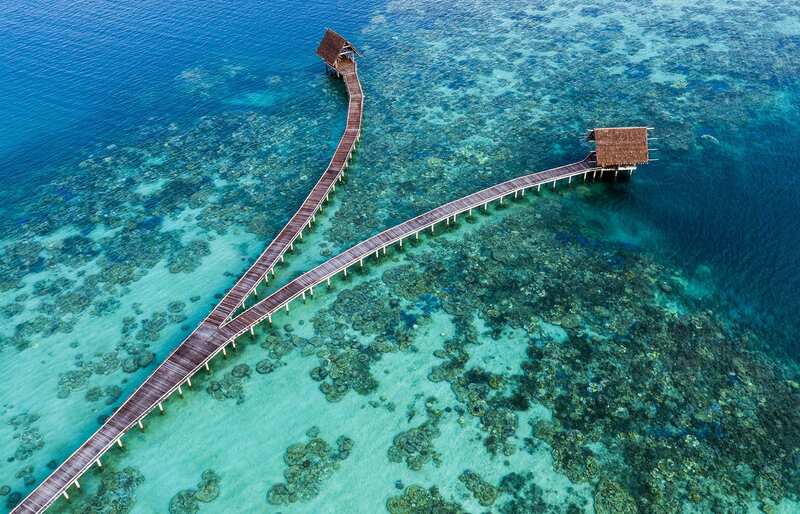 This island resort is located only 150 nautical miles off Singapore, but it could just as well be a world away. Getting there was an adventure in itself, and it felt like being gradually removed from civilisation. First, we were picked up from our hotel in Singapore (we stayed at the Six Senses Duxton) and taken to the ferry terminal. Accompanied by the hotel representative we sailed to the island of Batam. Then another drive, to a local airport, and soon we were boarding a private amphibious aircraft. 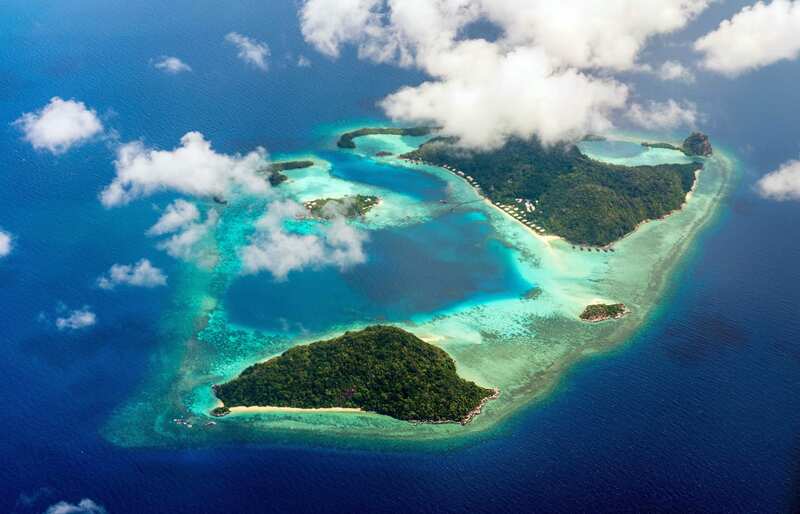 It took some 90 minutes to fly to the Bawah archipelago. It’s not a quick journey — and yet, it was worth it. 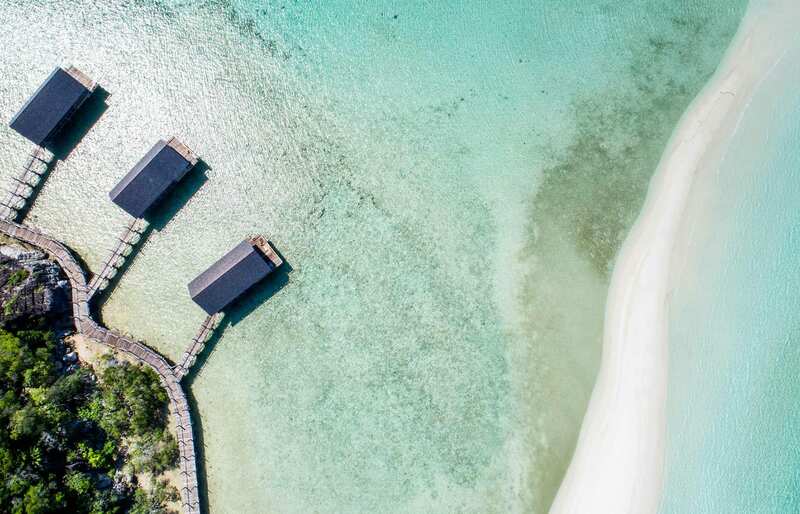 As the seaplane neared the destination, it circled the paradisiacal spot of blue lagoons and coral reefs, deserted beaches and the thick, tropical greenery covering the islands, all basked in the brilliant sunshine. Everything here felt in sync with the impression of being sheltered in carefree insular seclusion — with every wish catered for. 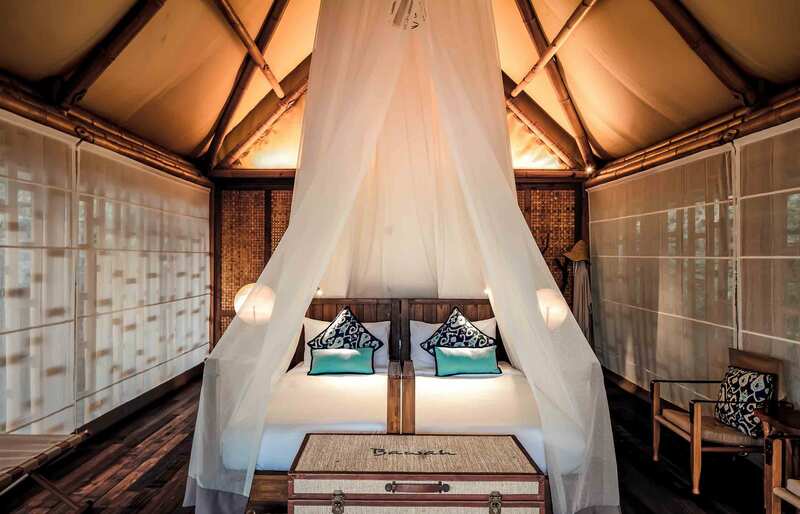 From the welcome ceremony to the arrival to our Ocean Bungalow, and then from the restaurant service to the spa, the experience of Bawah is designed around the promise of luxury in a remote tropical destination. 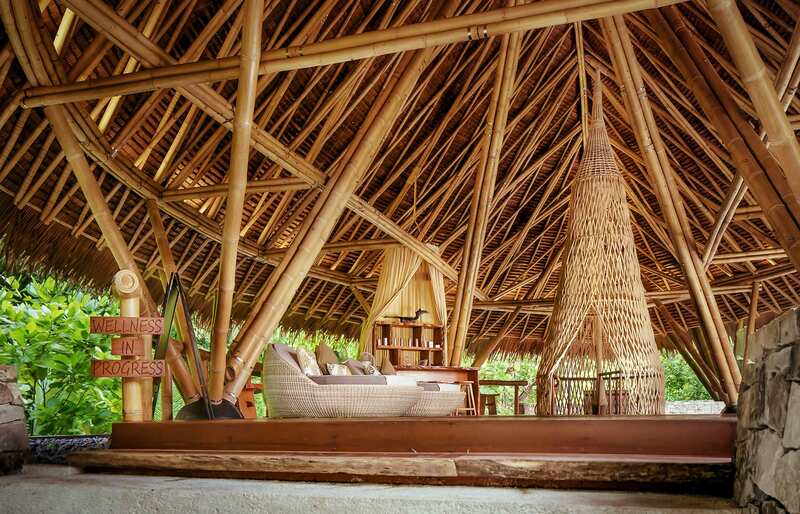 The style of the resort matches the theme of eco-luxury. 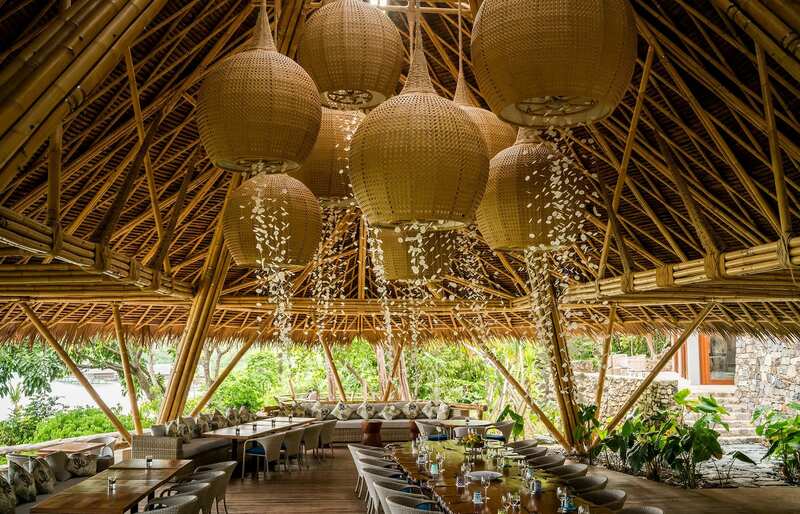 There are roofs thatched with palm leaves, tables and chairs put together from flotsam (at the beachside Boat House), while the Tree Top restaurant and the library wow with art installations and the jellyfish-shaped lamps, hung from the roof. 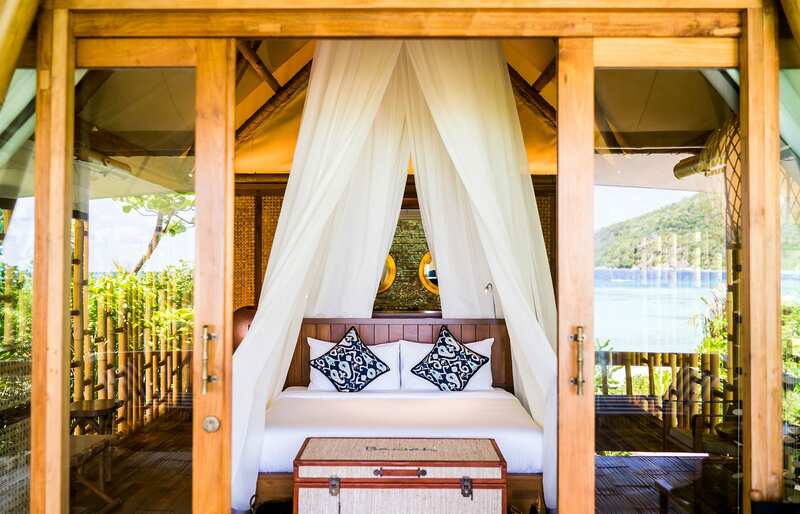 The guest bungalows and suites have a natural elegance, thanks to teak floors, canopied beds and soft rugs. 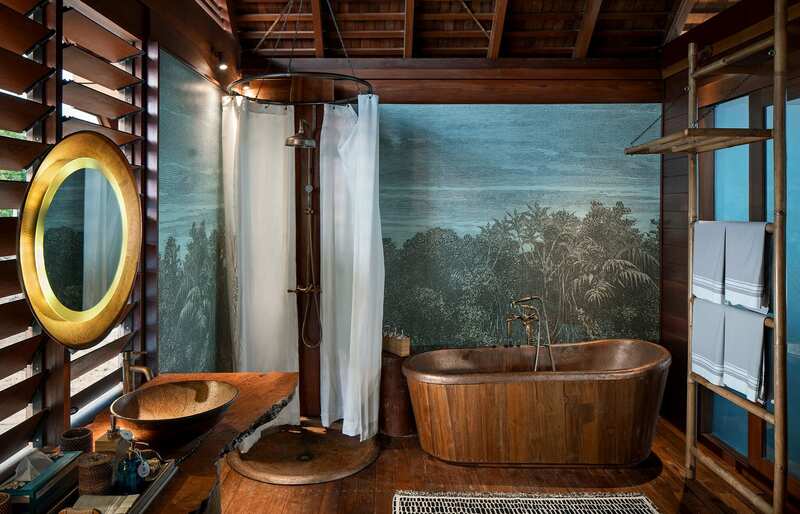 Free-standing copper bathtub, bamboo lattices and a sophisticated wallpaper give the rooms a unique character. 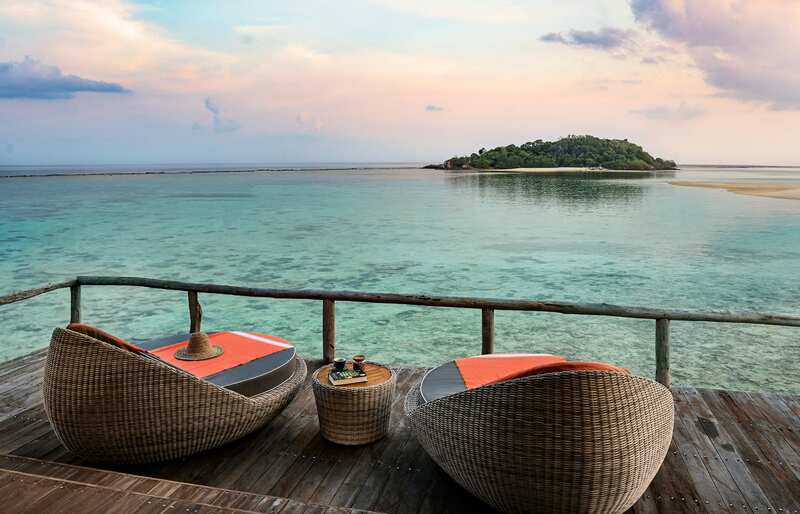 Bawah has its own brand of lo-fi relaxation and barefoot luxury, with a strong back-to-nature mindset — which is apt, given that this small archipelago of “6 islands, 13 beaches and 3 lagoons” is a marine conservation zone. The resort makes a lot of effort to be a steward of nature here. 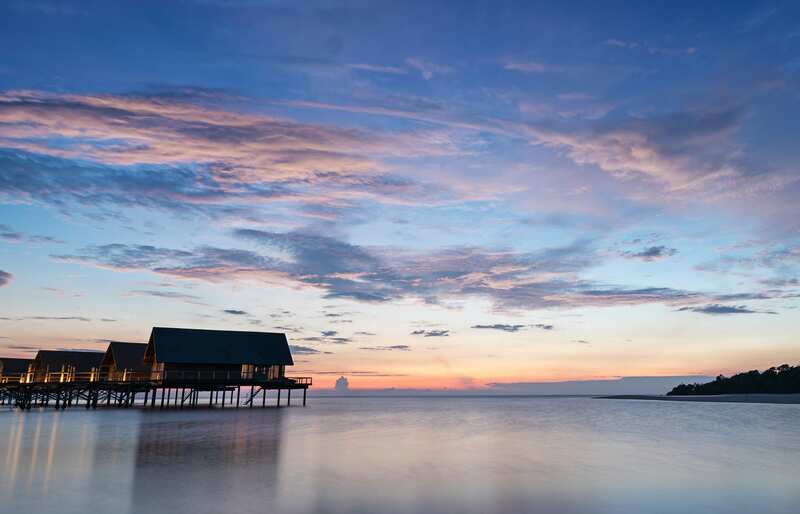 There is a no-waste policy, pesticides and fishing are banned, and a high-end water purification system is in place as well, installed by a specialist firm from Scandinavia. 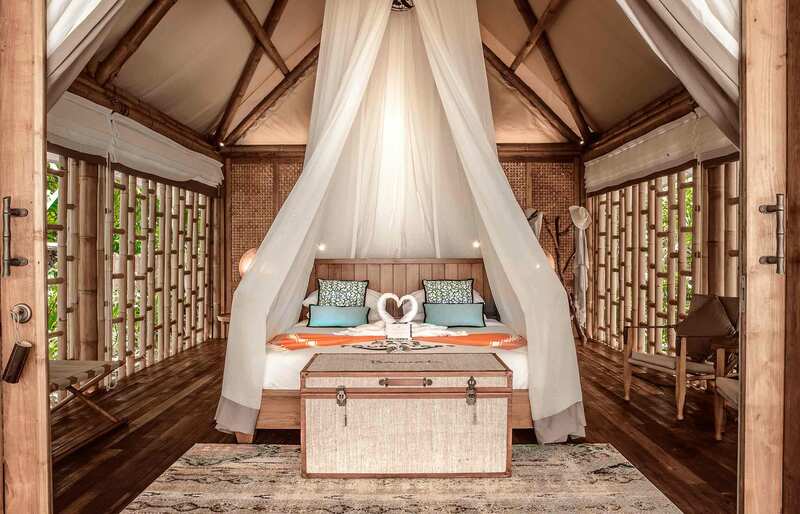 This is one of those places where the promise of “all-inclusive” luxury is meant literally. 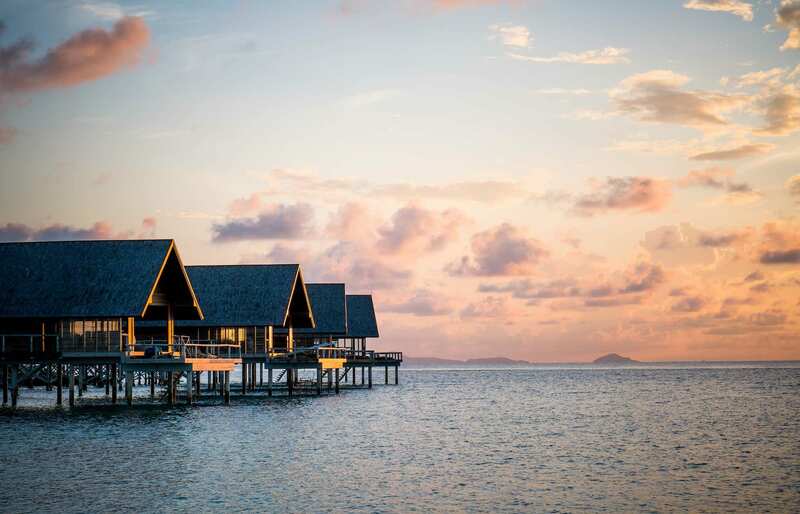 The transfers (including on the seaplane) are covered in the hotel rate, and so are all guest experiences — including, the best of all, daily spa treatments. It became a daily ritual for us to spend up to two hours there trying out different treatments from the spa menu. There are many other attractions on offer. 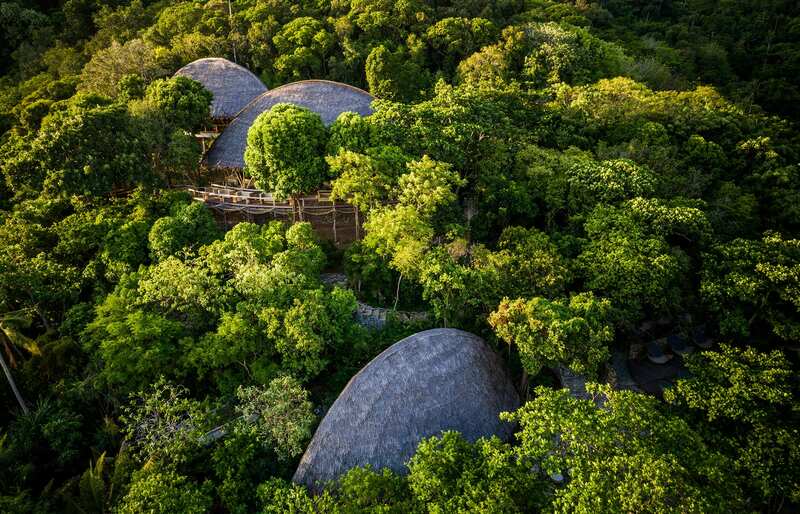 We would wake up with the sun and fill our time with a ton of activities, from kayaking to hiking and from open-air cinema screenings to sunset dining in the Tree Top restaurant. One of the best things we’ve done was a deserted beach experience. The excellent staff of the resort took us on a boat ride and left us alone with the picnic set up under a gazebo. It really felt exclusive, romantic, and adventurous to have an entire beach to ourselves. 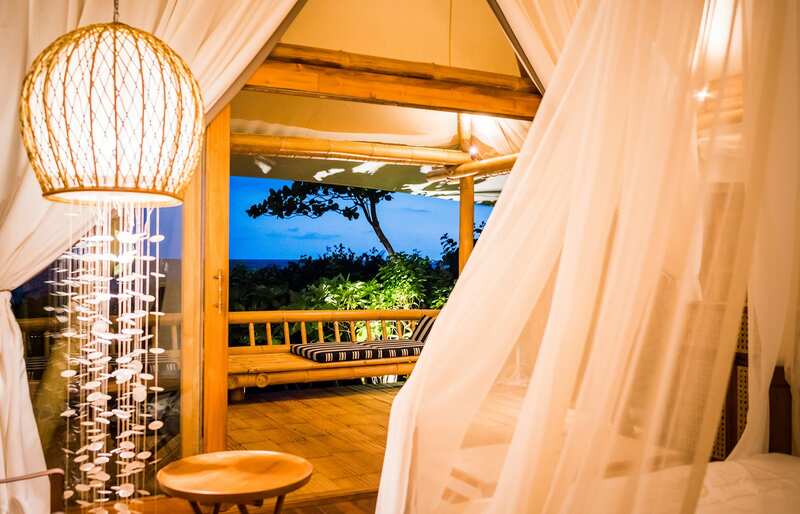 Another thing we loved was the dinner under the stars at the Tree Tops restaurant, in a special spot called The Lookout, which has sweeping views of the sea from the tree canopy level. 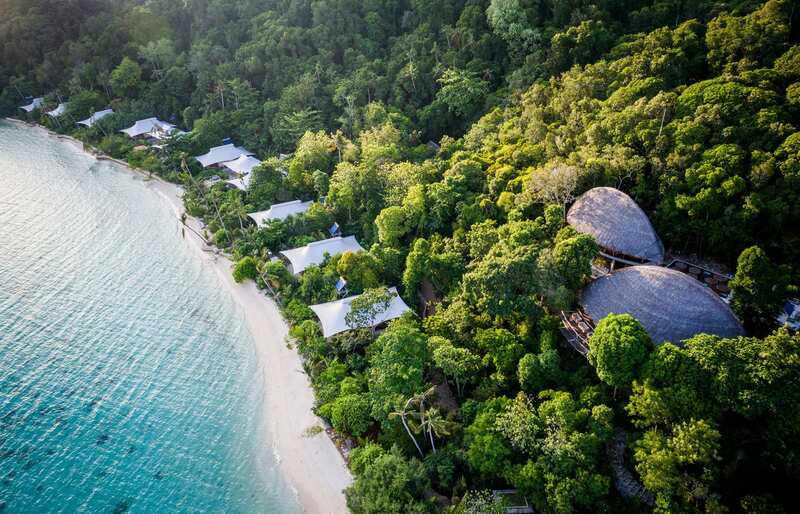 There were so many things we wanted to try and do here that the few days we spent at Bawah seemed too short and quite busy — if you treat paddling, spa, boat rides, and walks on the beach as “doing” things. 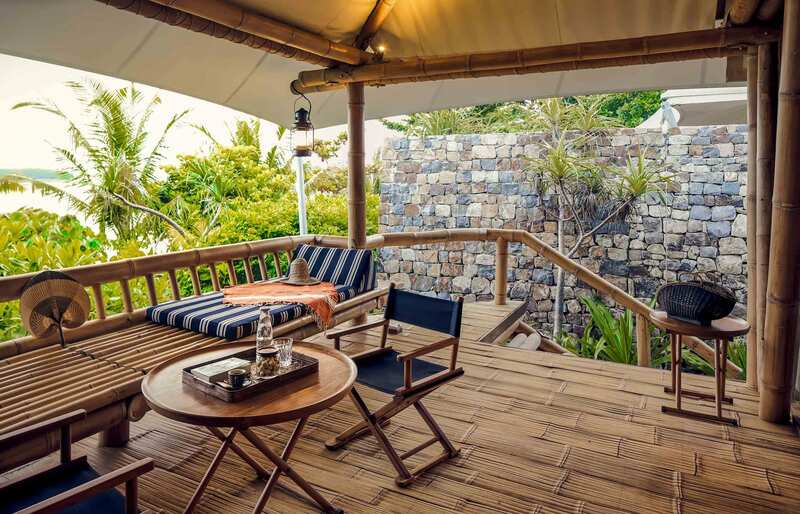 As we were preparing for our departure, we felt that we are leaving behind a resort that managed to put together all the best ideas from the barefoot luxury templates and craft it into a perfect escape destination. 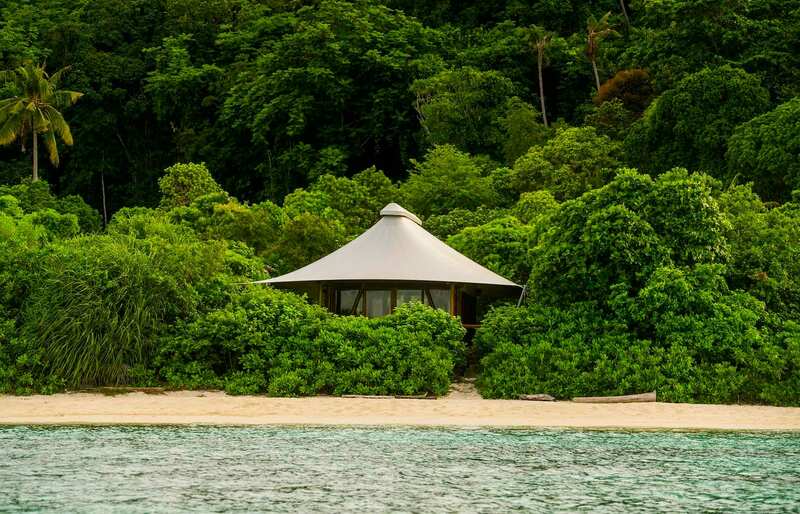 The Bawah Reserve promises — and delivers — a stunning private island experience. 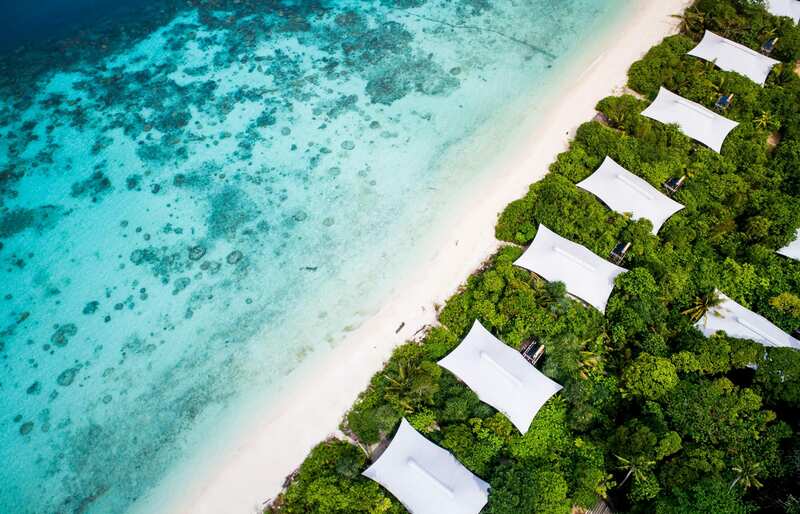 Combined with a visit to Singapore, it's a perfect counterpart to the bustling metropolis, and its blue waters and beautiful tropical nature should put it on the luxury travellers' bucket lists, right next to the Maldives. Wonderful location and setting. 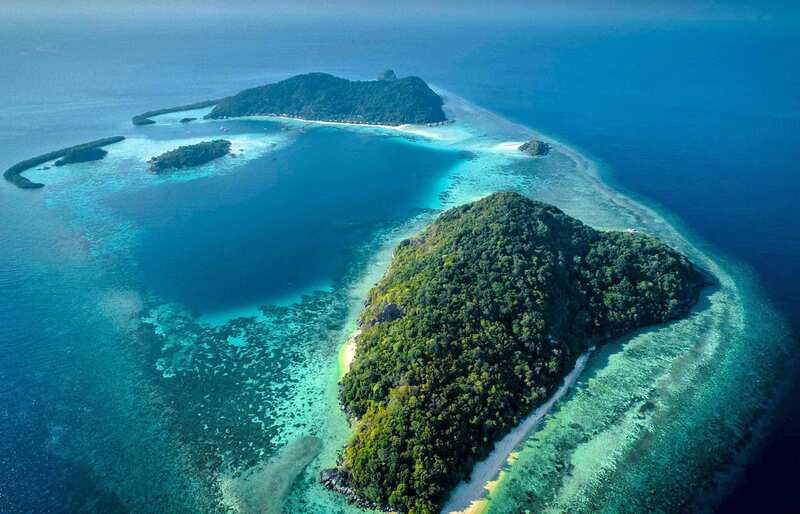 The islands are covered by lush jungle and are ringed by white beaches and surrounded by blue lagoons. 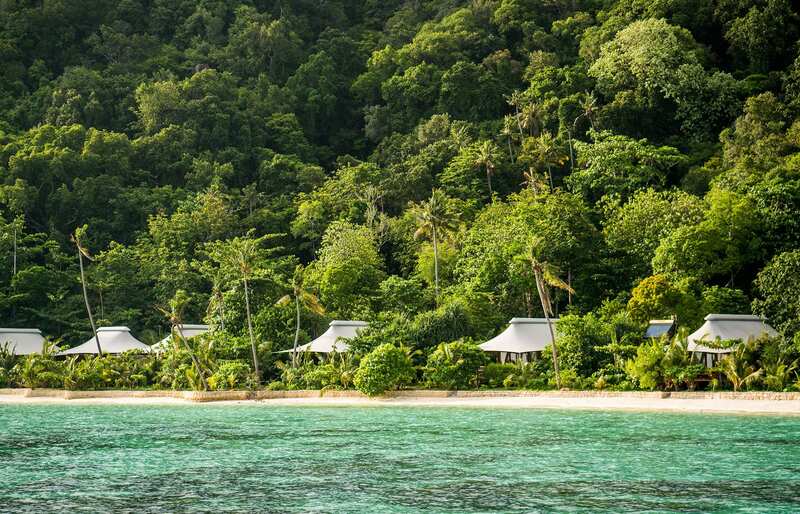 There is a real feeling of a “Robinson Crusoe” kind of vacation. 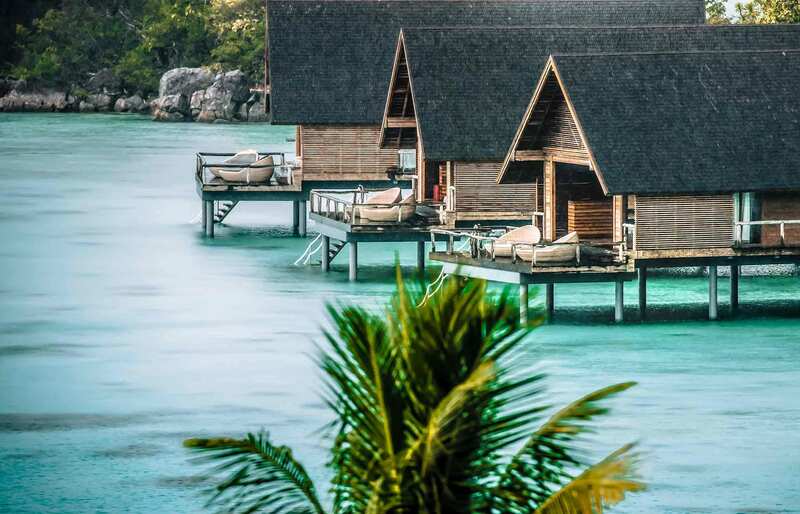 We stayed at one of the Overwater Bungalows. 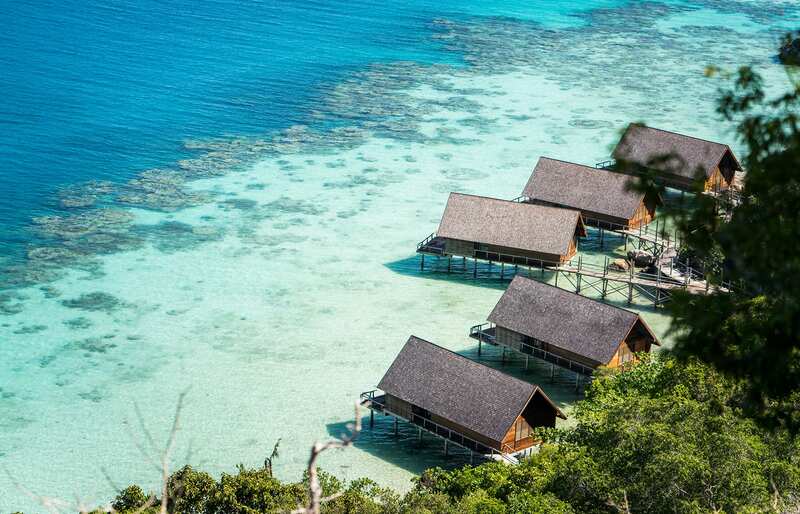 These are essentially villas-on-stilts positioned in the shallows with plenty of space between each accommodation. 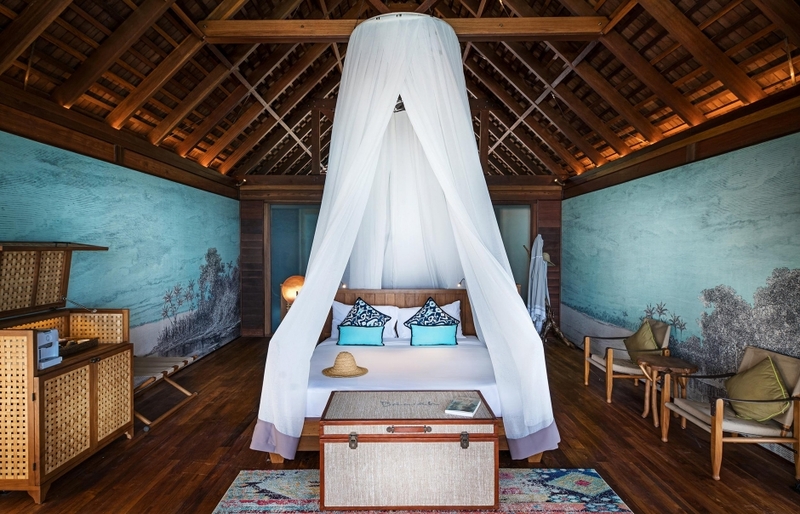 We loved the interior, with bedroom canopy, beautiful bathroom, and a spacious terrace outside, furnished with Dedon loungers. It was our favourite place to rest, or to have a meal. The guest bungalows don't have numbers: they have the names of the current guests! This is very cute and feels personalised. We enjoyed the food at Bawah. The menus matched the overall promise: the dishes were unpretentious and tasty. One lunch was organised for us as a picnic on a deserted beach. It was one of the highlights of the entire stay. A very high level of service throughout. Every member of staff here is professionally courteous, and they all went the extra mile to personalise our arrangements and experience and ensured all the smallest details we were taken care of. The daily rate covers laundry, all kinds of activities and daily spa sessions, and a la carte dinners. 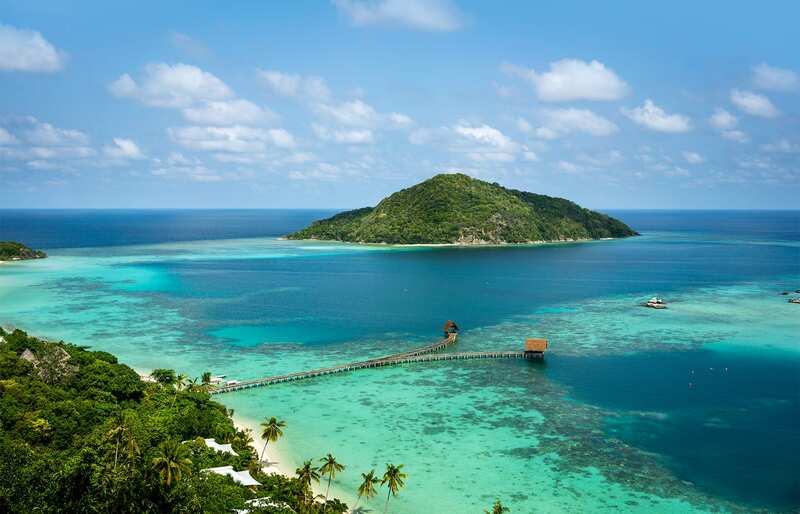 The resort stands amid a marine bio-diversity reserve, which ensures great snorkelling experience. 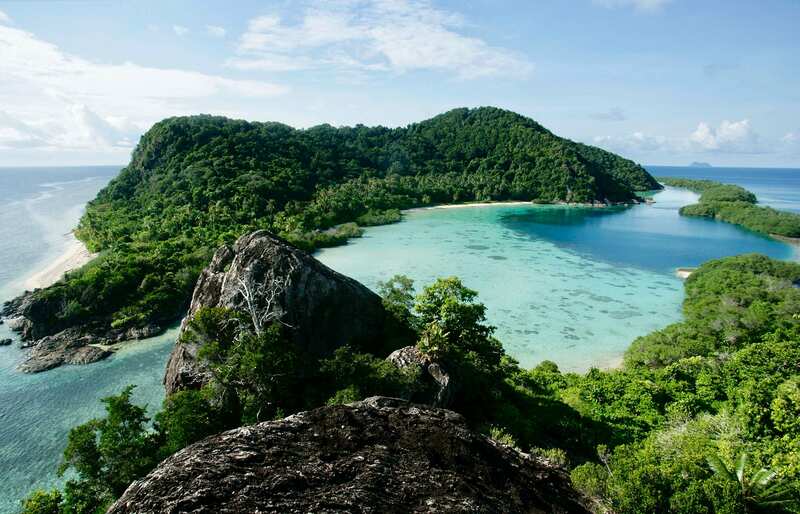 It also means Bawah poured resources and effort into being a responsible steward of these pristine islands. There is a hiking trail that winds way up and deep into the jungle, and one of its secrets is a bit hard to find — it is this rather precarious spot on top of a cliff. 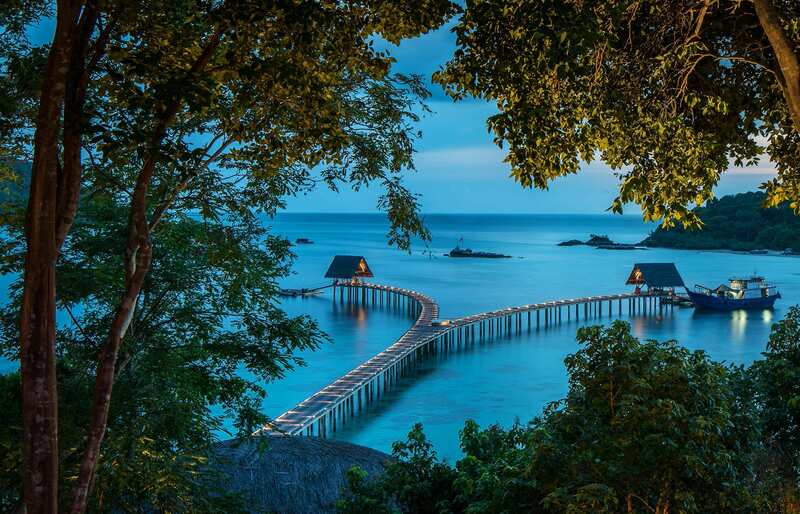 The reward for finding it is a beautiful view of the archipelago. Pickup from Singapore was for us at 7 am, and then the journey by car, ferry, car again, and then the amphibious aircraft took about three hours. 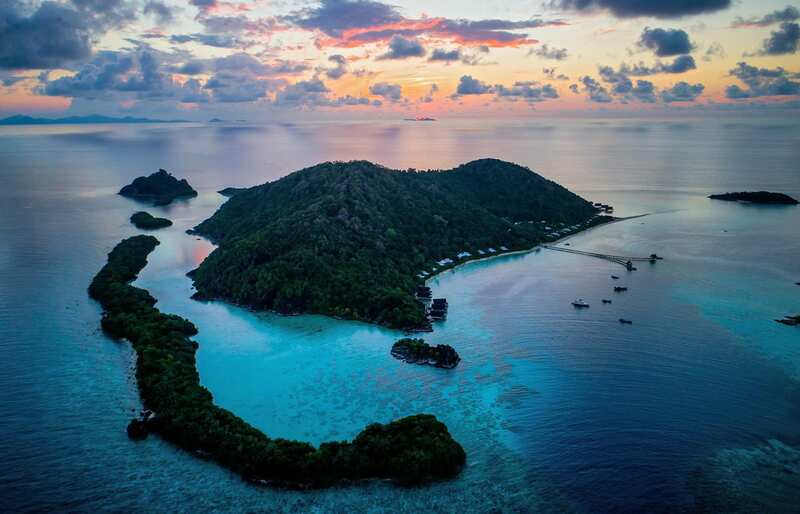 Tip: the pilot will circle the Bawah's mini-archipelago from the southern side — choose a seat on the left of the seaplane for the best views! 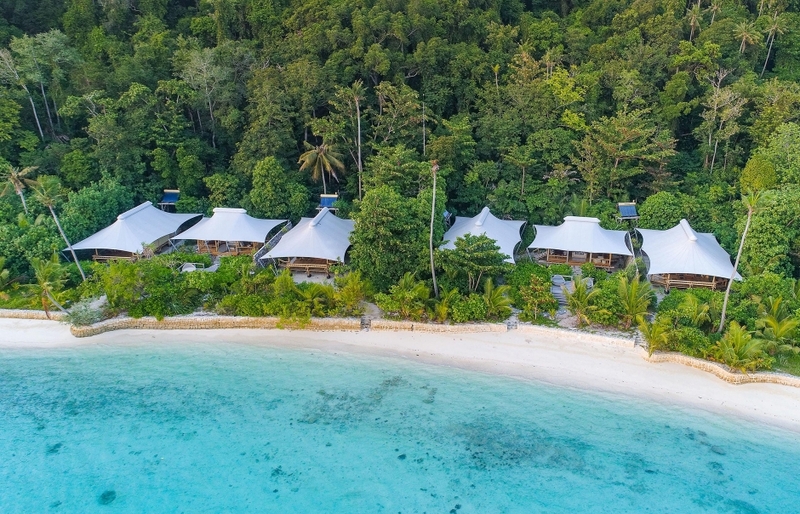 There is no gym here at Bawah, but you can easily stay active, e.g. 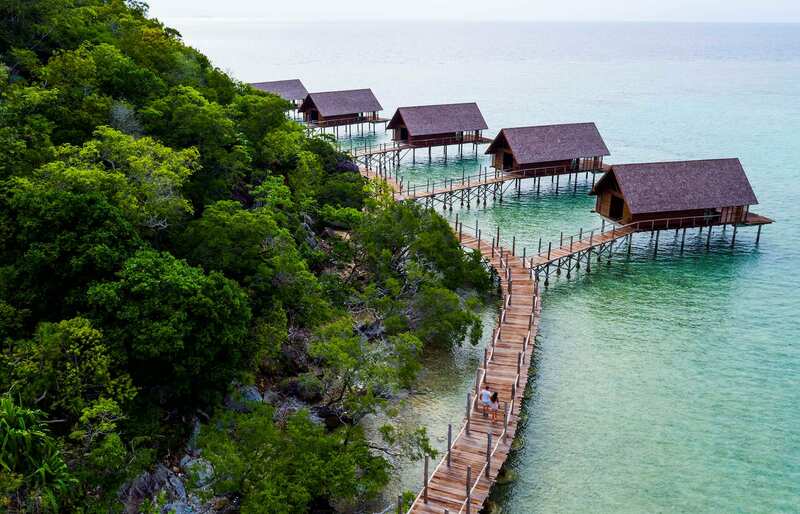 by kayaking, hiking or swimming. 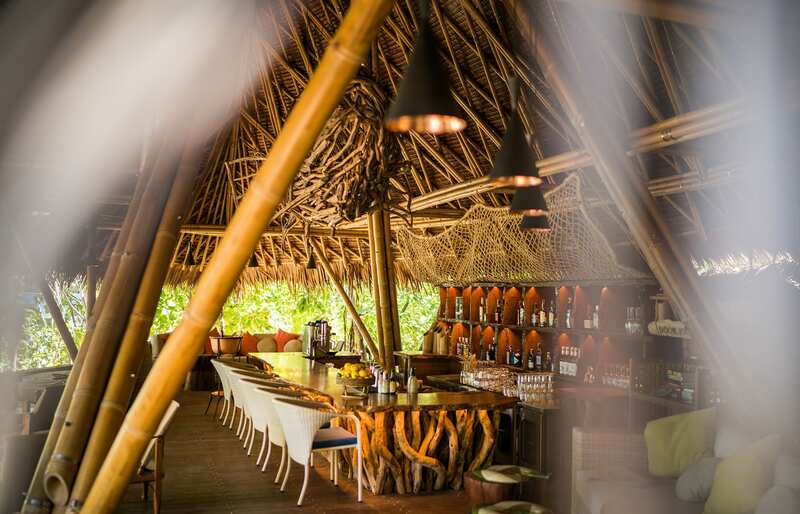 The “all-inclusive” promise stops at soft drinks — alcohol is charged extra. So is diving. The air con in the room was great, but the natural ventilation in the bathroom did not exactly work and it really felt hot in there, especially in the afternoons. 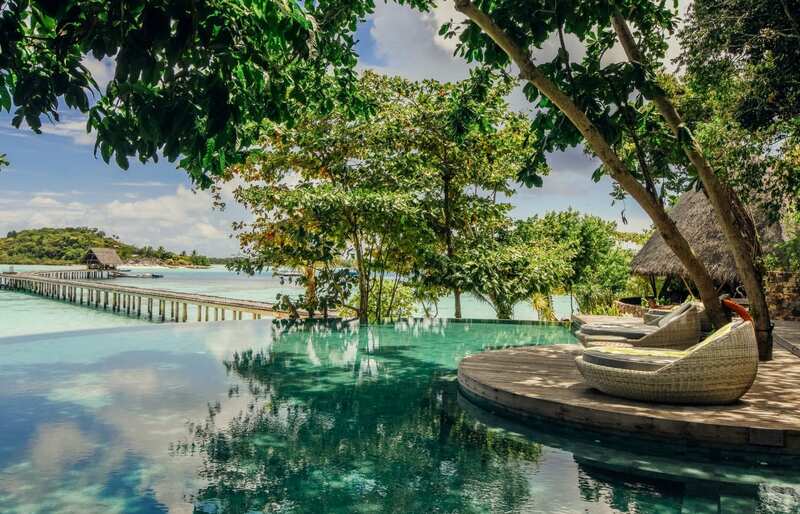 The resort is not suitable for guests with disabilities.